A frightened little boy killed in 1956 cries out for his mother from the body of an eighty-one-year-old Alzheimer’s patient. The soul of a spinster killed in a Suffragette rally wakes in the body of a new mother. An Orthodox Jew, murdered in 1922, opens the eyes of a man who just committed suicide and a teenage girl wakes to discover she’s now in the body of a forty-five-year-old woman. This is a very strange book, but in a good way. Second Lives really relies on you having an open-mind as it discusses reincarnation. I grew up reading a book constantly called Elsewhere by Gabrielle Zevin, and Second Lives showed the themes I loved most, but much more focused on the adult audience rather than YA, which I now really appreciate. From the get-go, you could tell how much thought has gone into each chapter and paragraph, and then right down to the final words. 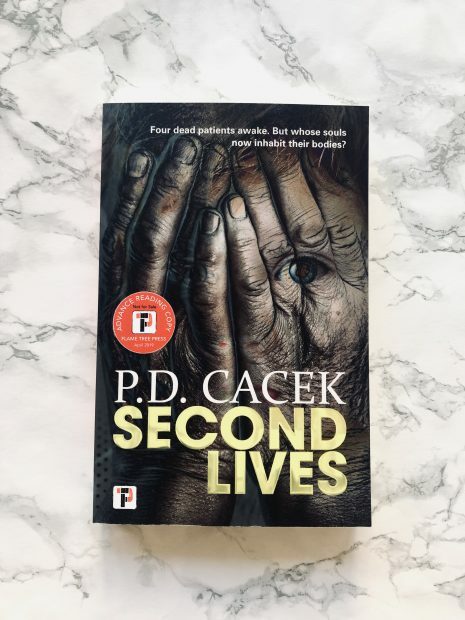 The book being split how it was, you could tell the experience Cacek has for writing, with reoccurring subjects but each with their individual characteristics and stories. I’m truly in awe of the detail, and how the book left you feeling. Because of how the chapters were split and the jumping around, it did take me a while to get into. The first part very much grabbed my attention, but it was difficult to remember each story and all the characters, because there were a lot. But at around 100 pages, I really got into the flow, and connected with each person mentioned. I loved the emotion displayed in Second Lives. It very much showed how loss and grieve affects different people but adding in the reincarnation aspect just shines light on different personalities. I also found myself laughing at one point, and then crying on the next page, so that’s a big tick in the ‘pro’ column for me. It resonates hope with the reader, although I would really question what I would do in either situation. You couldn’t tell where the book was leading, so throughout I was constantly thinking about the characters I was so very attached to.